Pacific Environment protects the living environment of the Pacific Rim by strengthening democracy, supporting grassroots activism, empowering communities, and redefining international policies. Sakhalin Environment Watch (SEW) has been working with international partners for many years to stop and modify Royal Dutch Shell’s oil and natural gas extraction projects on and offshore Sakhalin Island, Russia. SEW represents the Nivkh, Uilta, Evenk and Nanai indigenous communities in their demands for a place at the table in project planning, cultural impact assessment leading to changes, and fair compensation. SEW’s strategies include community blockades of construction sites, and extensive documentation of the impacts of dredging, platforms and pipelines on already endangered wildlife, traditional land-use areas and local infrastructure. SEW leaders have written and met with the European Bank for Reconstruction and Development repeatedly to protest approval and funding of Shell’s Sakhalin project, and have generated shareholder resolutions and media coverage of the unethical practices of these corporations. 2005: Channel made a grant to support Pacific Environment and SEW’s community organizing work with the indigenous communities of the Sakhalin Island region to ensure that their sovereignty and cultural rights are respected, as well as the sustainability of endemic species – and that these conditions govern Shell’s oil and gas drilling and pipeline plans. Summary of the January 2005 protests on Sakhalin Island written by Sara Moore, Russia/ Policy Program Associate, Pacific Environment, based on a November 2005 report from SEW’s Dmitry Lisitsyn (who later won the Goldman Prize in 2011). The protests came about because of the considerable negative impact Sakhalin gas and oil development projects are having on the minority indigenous communities (what the Russians call the Native Minority Peoples of the North). So far, there hasn’t been an evaluation done on the impacts, and the indigenous peoples are seeking such an evaluation (a cultural impact assessment), and, based on the findings, a compensation fund (an indigenous peoples development fund). Reindeer pastures, rivers, and marine bays, where the indigenous peoples have traditionally carried out their subsistence activities are very much at risk of decimation by the massive oil and gas developments on Sakhalin. In October 2004, at a regional assembly of indigenous peoples, the communities came together to decide that direct action was needed, and in January 2005 local NGOs and political parties worked together with the indigenous groups to arrange two picket lines to close down the Exxon Sakhalin I and the Shell Sakhalin II facilities. The protests were kicked off January 20th, 2005, with a meeting held on the sacred ground of the indigenous Nivkh (see the photo with the speaker with the megaphone and the crowd circled around). The oil and gas company representatives were invited, but didn’t come. On January 21st and 22nd the protestors picketed and closed down access to the Exxon facility, and on January 23rd did the same to the Shell facility. Some messages that were carried on banners and placards at the protests were: “We demand a cultural impact assessment!”; “Stop the politics damaging the life of Sakhalin’s Evenks” (see photo); “Fish are our wealth!” The main banner for the action bore a quote from a speech of President Putin’s: “Oil company people, you have to remember on whose land you are working. – V.V. 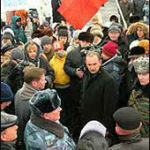 Putin, Salekhard, 2004.” About 300 people came to the action, including political party representatives (from the LDPR and Green Party) and Sakhalin NGOs (from Green Patrol and Sakhalin Environment Watch), but mainly the protestors were representatives from the Sakhalin indigenous peoples (Evenk, Nivkh and Uilta, primarily). At one of the pickets a bonfire was built. Traditional dances accompanied the picket line. At the Exxon facility picket, the trucks tried to use a detour to get to the facility, but on the morning of the 23rd a truck trying to use this road, which was not intended for heavy cargo, overturned (with no one injured; see photo). This occurred just fifteen minutes after a Nivkh shamanic ritual took place at the protest site: the protestors took this as a sign of approval from the Nivkh gods. The overturned truck resulted in a complete stoppage of traffic to the facility. At the Shell facility picket, some security guards wanted to leave the facility to go home after a long two-week shift. The protestors and workers nearly came to blows (see photo), but when things got heated, police that were present helped control the situation (without brutality), and the protest organizers eventually talked the indigenous representatives into letting the guards pass to go home. The blockade stood the remainder of the day. Copies of the protestors’ memorandum of demands were sent to regional and federal authorities as well as the oil and gas companies working on Sakhalin. Negotiations with the oil companies began after a January 24 press conference in Yuzhno-Sakhalinsk. The action was widely covered by local, national, and international press. Unfortunately, a massive national protest was taking place over welfare benefits at the same time, so there was no television coverage of this protest. The officially recognized NGO representing the indigenous peoples of Sakhalin (RAIPON-Sakhalin) had been put in limbo by a Judicial Department ruling right before the protest, and so in March 2005 protest organizers worked with the indigenous peoples to draft a charter for a new group “the Union of Indigenous Peoples of Sakhalin,” which then held elections to choose a representative for oil and gas company negotiations. By June there were still no headway made with the oil and gas companies, so a second round of protests (see photos) took place on Sakhalin at the end of June, coordinated with actions in London, Moscow, and New York. On June 28 they closed down the road to the Shell facility, and on June 29 the Exxon facility. On January 28, 2006, with the indigenous peoples’ demands and other key community demands still not being met, another blockade took place, this time of Shell’s massive LNG plant in the south of the island. This time, the local government directly supported the action, and the Governor of Sakhalin even gave a speech at the protest site (see photo). The Sakhalin people as a whole– indigenous people, commercial fishermen, schoolteachers, politicians, and civil servants– are growing increasingly outraged by the indifference of the oil and gas companies. Currently, Shell’s subsidiary company on Sakhalin (Sakhalin Energy) is working on a long-term Indigenous Peoples Development Plan, and the Sakhalin Regional Administration has developed a plan for economic and social development for Sakhalin’s minority indigenous peoples for 2005-2008. A sacred site in the north, where oil company workers had built a construction site, was completely cleared of equipment and reseeded or returfed. These small improvements would not have occurred without the indigenous peoples’ protests. At the moment, the European Bank for Reconstruction and Development (EBRD) is in a 120-day comment period that will end April 21, 2006, and thereafter with a decision on offering financing to Shell’s Sakhalin II project. Sakhalin NGOs and other concerned groups are focusing their attention on making sure the EBRD makes a fully informed decision. 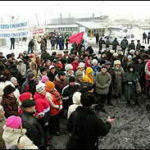 Indigenous peoples protest oil and gas developments on Sakhalin Island in January 2005.